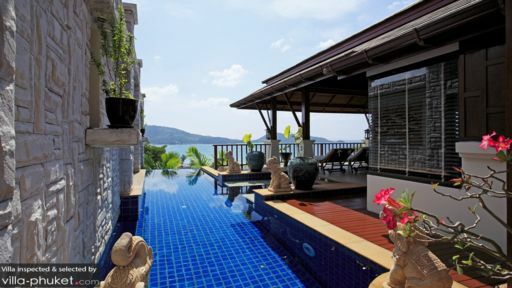 Villa Suriya is part of the L'Orchidee Residences, a villa estate made up of 25 standalone luxury properties. Embracing the best of island living at this hillside getaway is a cinch, thanks to its incredible coastal landscape, top of the line amenities and impeccable service. Featuring sun-dappled outdoor spaces, a capacious indoor living area and three bedrooms, Villa Suriya is well-suited for accommodating travelling parties of six. Descend down a stairway from the main living area to access the three bedrooms. Two are master suites with spectacular sea vistas and whirlpool tubs, while the third is furnished with twin singles. All three rooms are equipped with private en suites. When you’re not exploring the hotspots in town, you’ll want to soak up the tropical vibes at the sun-drenched spaces of your villa. A sparkling infinity pool stretching out towards the sea offers a prime spot for taking in the stunning seascape. By the poolside are recliners and outdoor furnishings - comfy spots for relaxing with noshes and nibbles. You’ll also enjoy access to shared amenities within the estate, which includes a clubhouse, swimming pool, kid’s pool, gym with sauna, convenience store, pétanque pitch and pool table. In the mood for parties? A spacious deck extending out from the clubhouse doubles up as a great party venue, and the on-site staff will readily assist with your event planning needs. Do check with our travel consultants on the terms and conditions for organising an event within the estate. Soft silks, oriental artworks and Thai-style architectural element add an Asian accent to the contemporary décor of Villa Suriya. Light colours and wood fixtures dominate within, while lofty ceilings lend the living areas a sense of spaciousness. Pull back the bi-folding doors to create an indoor-outdoor space or keep the living area enclosed for air conditioned comfort. Set in an open layout, the main living area contains a lounge, dining area and kitchen. Meals may be self-catered, but you’ll also have the option of ordering from the estate’s central kitchen. An eight seater dining set is the focal point for dinner parties; otherwise, much of the socialisation takes place at the lounge, which comes fitted with couches, a 42-inch plasma TV with DVD player and sound system. Airport transfers, along with housekeeping, security and personal guests services are included with your stay. A free shuttle bus service that runs between your villa and the estate entrance is provided. Amenities available at additional charge include: vehicle rental, private driver, baby cots, child minding services, laundry services and in-villa massage treatments. Bustling and energetic are words that best describe Patong. As the island’s hotspot, the town is known for its vibrant nightlife, dining and shopping scene. 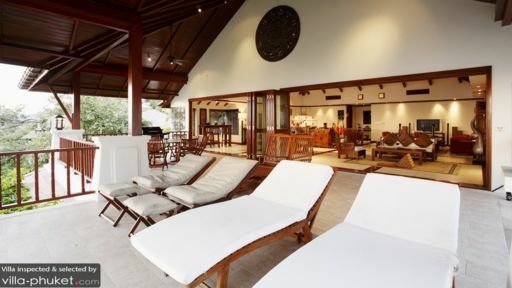 Villa Suriya puts you close to a wide-ranging array of attractions and amenities. Patong Beach is 10 minutes’ walk, and if you’re seeking a quieter beach ambience, take a 20-minute drive out to the beaches of Tri Trang, Paradise of Freedom. Dining venues are peppered all around the vicinity. The popular Sea Hag Restaurant is just a stone’s throw away from Patong Beach, while venues like Da Maurizio, Joe’s Downstairs, Pan Yaah and Sandwich Shoppe are located an easy drive away. You’re also just a three-minute drive away from Kalim, which boasts a variety of fine dining restaurants. Away from the beach, some of our favourite ways to unwind include going to the spa, joining in a cooking class or exploring the island. 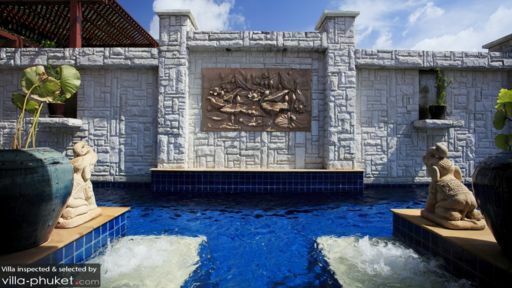 While in-villa cooking and spa rituals may be arranged, we enjoy the ambience and amenities at places like Pum’s Cooking School and the Aqua Spa at Avista Hideaway. Radar Hill Viewpoint, the Big Buddha, Kathu Waterfall and Phuket Old Town are sightseeing spots that come with our recommendations.